All of our rates are based on a party of up to 4 guests. For each additional person, over 4 people, in your party it will add $10 onto the rate each night. 12% taxes will be added the total price of your reservation. We no longer offer a $200 security deposit. Instead, we have a Damage Protection Waiver - "DPW" is a $45.00 non-refundable damage waiver that is added to every reservation. The DPF will cover up to $750 in accidental or inadvertent damages if, and only if, the damage/accident is reported at that time of occurrence. This is also listed on the Rental Agreement and FAQ. Holiday Rates will apply to the following holidays: New Year’s Holiday, Independence Day Holiday, Thanksgiving Holiday, and Christmas Holiday. Get AWAY AT LAST to Blue Ridge, Georgia! 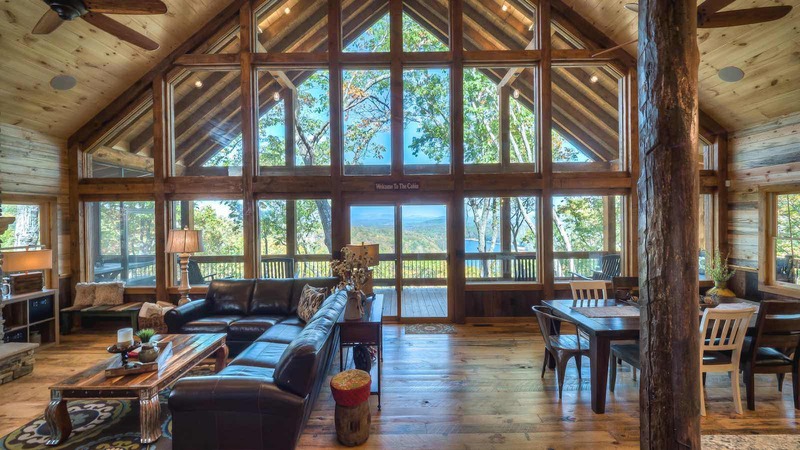 This spectacular one-of-a-kind property has jaw dropping views inside and out. 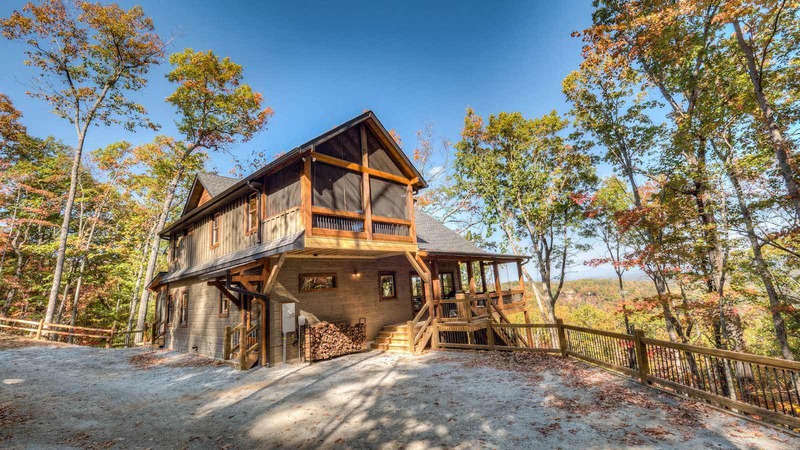 Away at Last is located in the Aska Adventure Area with long range views of the mountains and Lake Blue Ridge. You will be a short drive from the Toccoa River, local hiking trails and Lake Blue Ridge! 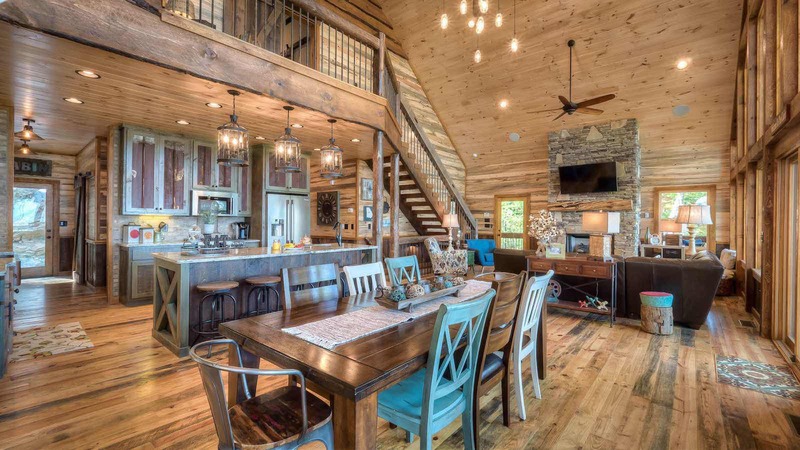 Away at Last pairs modern yet rustic decor with beautiful industrial and unique touches throughout the cabin. The wood and metal elements in every piece of this property were all selected for their unique textures and their contrasting features. You have to see this cabin to believe it! As soon as you arrive, you will be in awe of the beautiful lake and mountain views. From the parking area, you can access the cabin via the lovely mudroom which houses the laundry services and space for your coats when entering the property. You can also access the main level through the great room from the main level deck. The main level deck that overlooks the incredible view has a hanging bed perfect for cozy reading and snuggling and rocking chairs. The deck wraps around the the partially screened area, which offers dining and seating around the stone wood burning outdoor fireplace. This fireplace has a TV atop the cedar mantle for added entertainment. Inside the main level, you'll see that the view is not the only beautiful thing about this property! The great room and kitchen are simply amazing... Granite countertops, reclaimed vintage tin redesigned as cabinetry, lots of different wood/lumber textures/colors hand selected for this property, a huge wall of windows facing the view, comfortable seating around the stone gas log fireplace which is topped with a flat screen TV above the cedar mantle. The kitchen is a work of art itself, with the unique custom designed cabinets, large iron chandeliers, stainless steel appliances, breakfast bar seating for 5 guests, and lovely farmhouse-style sink. Just around the corner is the half bath, which boasts a whiskey barrel cabinet and bowl sink. The main level bedroom is just off the great room and has a king size luxurious bed, its own private bathroom, and flat screen TV. This bathroom has a stone tile shower, reclaimed tin walls, "rough sawn" cabinetry plus a granite countertop double vanity with two copper sinks. Up the stairs to the luxurious and impressive master level! The loft area has cozy seating for reading, laptop surfing, or just snuggling while overlooking the wall of windows. The master bedroom has a flat screen TV, a hand crafted king size bed, its own private balcony with a 2nd hanging bed, and private bathroom. The huge bathroom truly dazzles when you open up the rustic barn doors, with two individual granite counter top vanities, reclaimed tin ceiling, a stand-alone soaking tub, lux tile flooring, and a spacious tile shower big enough for two people. If you can tear yourself away from the stunning main level and upper level, head down to the game room level. The spacious game room level has a pool table, foosball, a cozy built in reading/lounging nook, large wet bar with seating for four, a big comfy sectional, a stone gas log fireplace with a flat screen TV above the cedar mantle. This level has two more bedrooms and two more bathrooms. One bedroom has a king size bed, flat screen TV, a private bathroom with a tile shower and has "rough sawn" cabinetry with a granite counter topped single vanity with a copper sink. The other bedroom is the bunkroom, which has custom designed built-in bunk beds. The beds on the bottom are both queen size, the beds on the top are both twin size. The bunk room has a flat screen TV and a private tile/tub combo in the bathroom. This bathroom also has "rough sawn" cabinetry plus a granite countertop double vanity with two copper sinks. Just outside this level is the soothing hot tub that overlooks the mountains. This deck also offers a “rustic cocktail bar” plus outdoor seating. 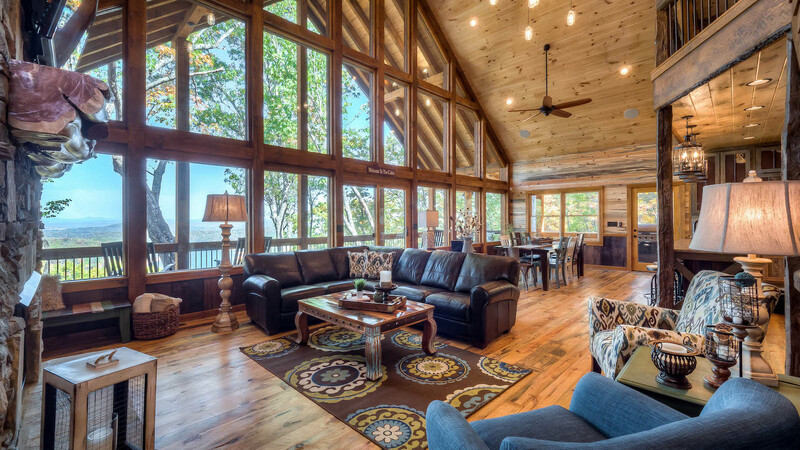 Away at Last is truly breathtaking cabin with wonderful amenities and awesome views. Reserve now and start counting the days until you are AWAY AT LAST in Blue Ridge!